Highlighting the emerging Advanced Manufacturing Innovation District (AMID) in Sheffield and Rotherham, a new project led by local firms looks set to significantly improve the performance of offshore wind turbines throughout their service life. 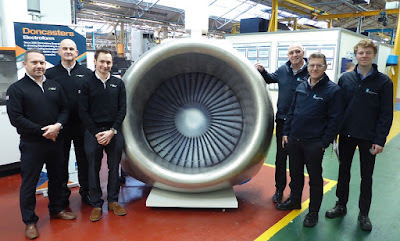 The Leading Edge for Turbines (LEFT) project, part-funded by Innovate UK, is a two-year, £1m collaboration between Doncasters Bramah, a Sheffield-based specialist aerospace component manufacturer and Performance Engineered Solutions (PES), an engineering design solutions business based on the Advanced Manufacturing Park (AMP) in Rotherham. The project is being supported by the Offshore Renewable Energy (ORE) Catapult in Blyth, the UK's leading technology innovation and research centre for offshore renewable energy. The project involves developing a novel system to protect the turbine blades from rain erosion which is currently the leading source of damage to offshore wind turbine blades and is caused by rain and wind hitting the blades. Over time this erosion breaks down the protective coatings attached to the blades, exposing and eventually compromising the blade's structure. It is a significant issue for both turbine manufacturers and operators as they look to improve a blade's operational life to match the 25-year active service life of the turbines. The LEFT project sees Doncasters using their expertise in supplying leading edge erosion shields for civilian and military aircraft and helicopters, to solutions for the offshore wind industry. Meanwhile the PES engineers are applying their experience in component performance and composites optimisation on the project. In particular this includes their understanding of lightweight materials, and aerodynamic design. The project will investigate integrating nickel cobalt erosion shields into the overall design of the wind turbine blades. Doncasters' electroforming method is an additive manufacturing process which enables them to "grow" the new erosion shields in a chemical bath. Andrew Woods, business development manager at Doncasters Bramah (pictured, third from right), said: "At Doncasters we have more than 20 years' experience of producing electroformed metallic leading-edge protection solutions to the global aerospace industry. This project represents an exciting opportunity for us to cross-sectorise this knowledge and capability from aerospace into the growing offshore renewables market. Along with our partners on Project LEFT we aim to adapt and develop a lifetime protection solution to arguably one of the biggest problems in the offshore wind industry today." Dean Gardner, engineering director at Performance Engineered Solutions (PES) Ltd (pictured, far left), added: "We already work closely with the Doncasters team on other R&D projects. One of the skills of our team is our understanding about materials, light weighting and design which we can apply within a range of industry sectors. As a team we really enjoy working on projects that are challenging and were we can create solutions that will make a marked positive impact for our clients." If successful, this project will lead to the introduction of a new product that provides significant benefits to the offshore wind industry. Performing better than the current coating solutions, the new metallic erosion shields are estimated to save operators around £1.3m per turbine during a typical service life, removing the significant cost of repair operations and downtime.